I have recently gone through a very traumatic experience that I don’t want to share with the world. if you feel like you’re close enough to me to ask what happened, ask away, but use your judgment on that one. I feel like my life was beginning to normalize from the past couple years (read this post if you want to know why my life has sucked) and finally I was getting my sh*t together. Then this happened. It feels unfair, crappy, and demoralizing. This experience is causing me to re-evaluate my life, my values, my morals, my decisions, and my behaviour. So this post is about how I am choosing to deal with my aforementioned traumatic experience. 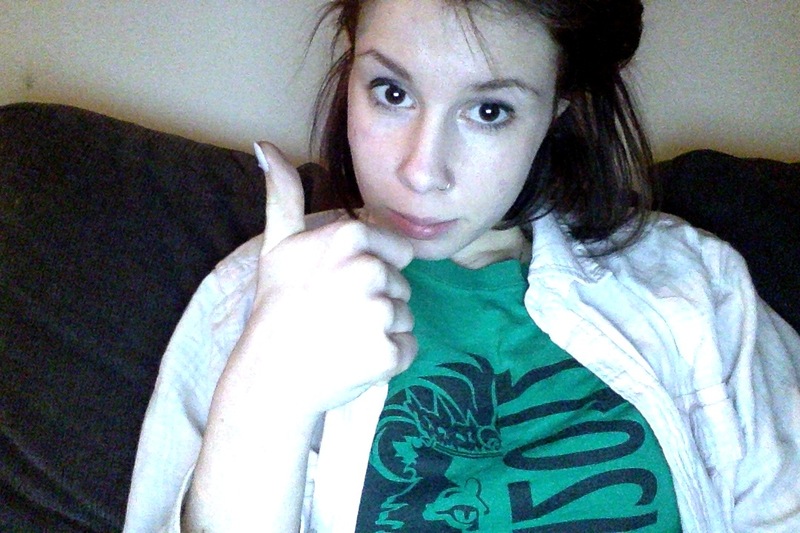 My unenthusiastic life re-evaluation thumbs up. Firstly, I am following my own advice in the above linked post. Right now I’m still in the self-indulgent, wallowing faze. I bought a fancy face mask and I’m going to veg out and watch Lord of the Rings with weird stuff slathered on my face. I’ve also removed myself to my dad’s house for a little while so I can be around my lovely little brothers who always brighten my day, my super-supportive dad, and my thoughtful step-mom. Thirdly (this is starting to sound like every essay I wrote in grade 9 before I figured out more interesting transitions than “firstly” etc. ), I am thinking really deeply about the people I spend time with. I’m referring to my acquaintances and not super-close friends. I don’t always keep the best company. I have some really great friends but a lot of the people I associate with aren’t really on the same level of human-quality as I am. I want to surround myself with better, more supportive, and more genuine people. This experience has opened my eyes to my misplaced trust in certain acquaintances and groups of people. So I’m kind of purging my social life a teensy-tiny bit. Fun right? Lastly, I’m really going to focus on myself and my own healing. When my mom died, I focused more on staying emotionally neutral and being strong for everyone else. At her visitation I worked the floor like I was at a conference, greeting people, introducing people, comforting people. I really worked hard to be strong. I settled all the financial arrangements, planned out her funeral with my dad, made a slideshow for her funeral which involved looking through tons of pictures of her. I really did too much and tried to take on too much so that I didn’t have to think about the sadness I was dealing with. This time will be different. I am determined to just do what’s best for me. Especially if it means watching all of the Lord of the Rings movies on repeat for the next couple days and drinking copious amounts of green tea. So that’s how I’m dealing with this shiznit. Wish me luck internet peoples.